Is Your Company Ready for The Radical Sales Shift? Over the last few weeks I've mentioned tidbits about a project I've been working hard on over the last year - my latest book, The Radical Sales Shift. Today on this blog I'm formally 'launching' it. One of the biggest challenges facing the leaders of B2B companies of all sizes right now is the change in buying behaviour. Technology has radically changed the way buyers make purchasing decisions. And this shift in purchasing behaviour has fundamentally changed the way businesses need to sell their goods and services. 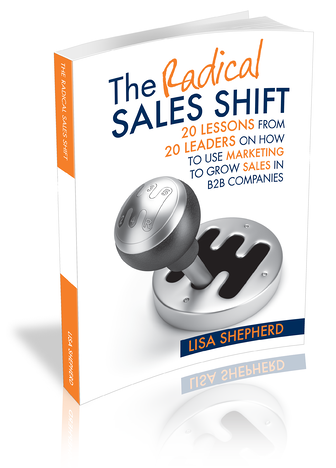 That's what The Radical Sales Shift: 20 Lessons From 20 Leaders On How To Use Marketing To Grow Sales is all about. Today’s tech-savvy buyers have taken control of the purchasing process and they now resist talking to salespeople until they’ve completed their own research and are confident about their options. That means marketing is now essential to getting the attention of buyers and driving revenue generation. For companies built on the use of tried and true sales techniques in the past, this is a radical shift. The Radical Sales Shift provides a practical guide to reaching this new buyer and a roadmap to revenue generation for companies in the B2B space. The book includes advice from 20 business leaders who have successfully navigated the new rules of B2B selling and buying. It also provides diagnostic tools to help organizations of all sizes assess their current sales and marketing capabilities. PS - we're giving away a $15,000 Strategic Marketing Planning Process.